In this project multicultural historical heritage was the launch point for the enhancement of the regional tourism offering. It has also helped to incentivise economic diversification. The small region of Tabor and Wisłok is characterised by a unique rural heritage based on mix of ethnic groups that have once inhabited the territory. Despite the changes resulting from the post-WWII migration of the population, the cultural memory, traditions and legacies are still vivid. The region also benefits from a nearby major spa town - Rymanów Zdrój - that attracts a number of tourists interested in discovering its rural surroundings. The main objective of the project was to improve the quality of life of the rural population through the preservation and promotion of the regional multicultural heritage. The safeguarding the local history was also expected to attract tourists and contribute to diversified income opportunities for local people. The project involved detailed research and documentation of the regional history. Investigations were carried out in close collaboration with the local community, through the collection of stories, old photographs and maps. A specific focus was placed on the three ethnic groups that co-existed in the region prior to World War II: Lemkos, Jews and Poles. 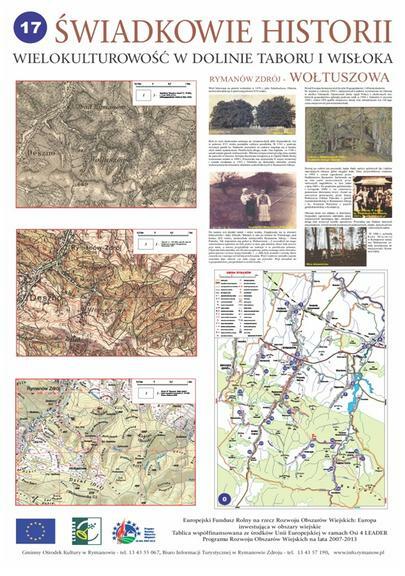 In all 31 historical information boards were erected in 16 municipalities and a visitor guide was published. The project has contributed to heritage preservation and it has enriched the local tourism offering. Sites that were under threat of abandonment due to the departure of the indigenous population have been documented and highlighted. The project has also positively affected local economic development: the growing number of tourists have led to significant expansion of accommodation, catering and trade services, offering new income sources for locals. History can be a trigger of innovation. In this project remembering and commemorating the Valley of Tabor and Wisłok's multicultural history has boosted tourism.